Enjoy all-day comfort in a breathable, wireless comfort posture vest. Criss-cross panels built into posture vest straighten shoulders. Posture support reduces back strain. Lace-trimmed, long-line fit smoothes and slims. 12 front hooks provide an easy on/off fit. Specify size: 34B/C, 36B/C, 38B/C, 40B/C, 42B/C or 44B/C. 33% cotton/62% polyester/5% spandex. Hand wash. These are wonderful bras. They are very comfortable and hard to find at a price most can afford. They reduce backaches and make one feel good. I would puchase this item again. My Mother has severe Osteoporosis and gets fractures of the spine and ribs. A rib binder is uncomfortable and usually doesn't stay where you put it. With this back support bra it gives her the extra support needed to relieve some of the pain and acts as a reminder to be a little more careful. This did not fit well nor help hold my shoulders back at all. Way too tight on ribs. I don't think this would help posture even if it fit better. Way too tight around rib cage and too loose up top to help posture in any way. I am having some back problems and I am beginning to stoop a little and so I am hoping to find some comfort for my back and shoulders while doing my daily routine. I had 5 back fusions, and need support. easy access - front hook up! looks like it will fit . I hope this relieves upper shoulder and back pain issues from posture issues. i need support for my ribs due to pain there, but would like something w/o stays like i have in my longline bras. I'd been looking for something of this type. I ordered the item for my wife to correct her posture. I think this is the best solution and the vest looks good. Hope this will satisfy her need. I have muscle spasms in my upper back and I find that a posture support vest helps. Help me to stand up straight. Too small. Could not use. Help support chest and back. looks like it would give support to my back. to help correct my posture and is also a bra so that I don't have to wear both. Does this come in a D cup size? BEST ANSWER: Thank you for your question. No, this item is not offered in a D cup size. We hope this information will be of help to you. i have a lot of trouble with my ribs an get nerve blocks on about every 5 months. a long-line bra helps to shore up the ribs during long chruch services or errands, but the stays dig into me and can cause more pain. i also have pain in my back, especially the lower are with oseoarthritis. i'm also not sure how to gauge the size as i'm heavy and the weight makes the waist wide. the cup size needs to be a small as possible due to breast suregery 10 years ago during chemo treatments. can you help? CAN PUT MY SIZE IN THE SELECT SPACE? BEST ANSWER: Thank you for your question. 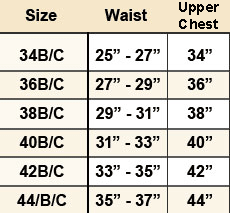 We only carry B C 34 if that is not your size then we do not carry it for this item. We hope this information will be of help to you. You only offer 34B/C. Will you restock the other sizes? BEST ANSWER: Thank you for your question. Unfortunately no we just have the one size. We hope this information will be of help to you. I need a 44B do you have this size? BEST ANSWER: Thank you for your question. Unfortunately no we no longer carry that size. We hope this information will be of help to you. 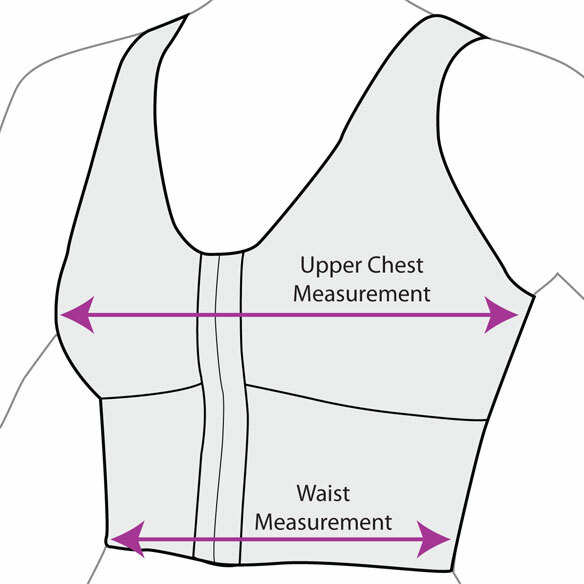 order by chest size or waist size? BEST ANSWER: Thank you for your question. You order by band size. We hope this information will be of help to you.